The recipe for Kugelhopf can be found on the James Beard Foundation’s website. 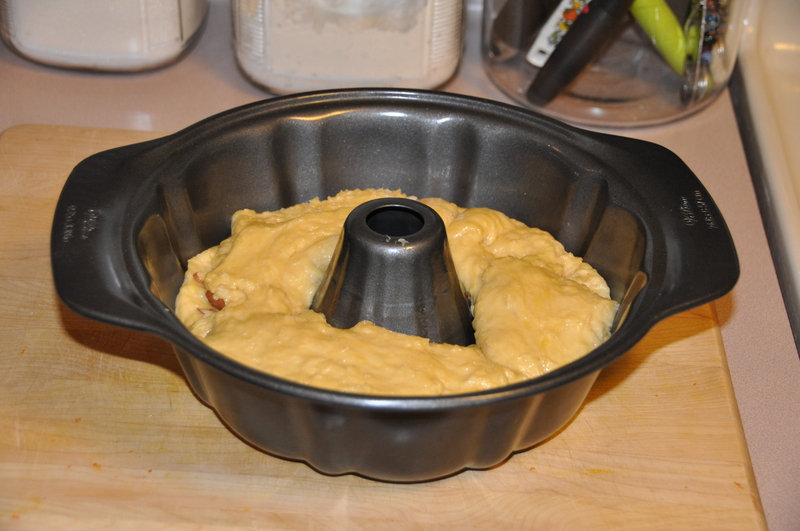 I substituted a similarly shaped Bundt pan for a Kugelhopf mold. Of course, I left out the raisins. While the yeast proofed with the sugar and water, I cut the stick of butter into two cups of flour with a pastry blender. 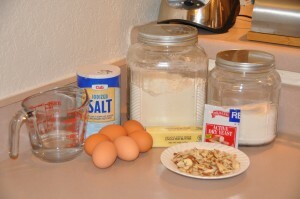 One by one, I added the eggs to the flour mixture and then alternately added the yeast mixture and the remaining flour. Then I poured the dough into a buttered bowl and let it rise. After an hour of rising, I stirred the dough down. I placed half of the almonds in my buttered Bundt pan, spooned in half of the dough, sprinkled on the remainder of the almonds, and then finally poured in the rest of the dough. Then I let the dough rise for another hour. I baked the Kugelhopf at 475 degrees for 10 minutes, and then at 350 degrees for 35 minutes. 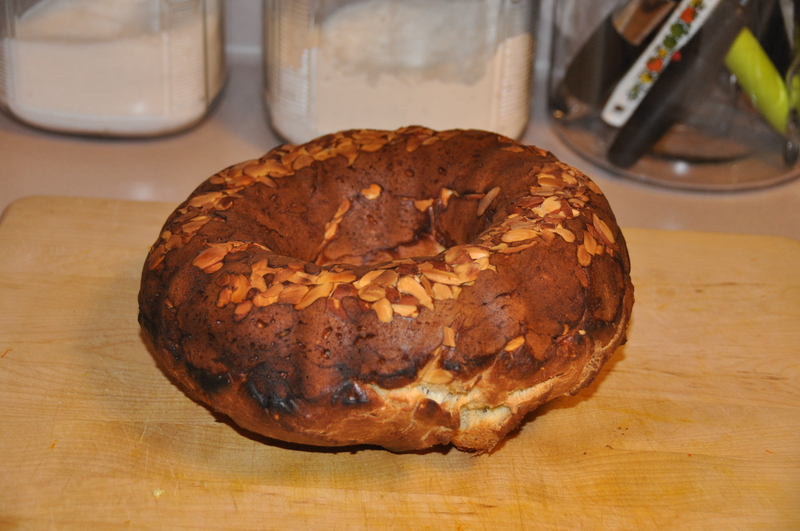 I would characterize Kugelhopf as an egg bread rather than a sweet bread–the egg flavor seemed far more pronounced that the sweetness, and it has a very rich, buttery texture. 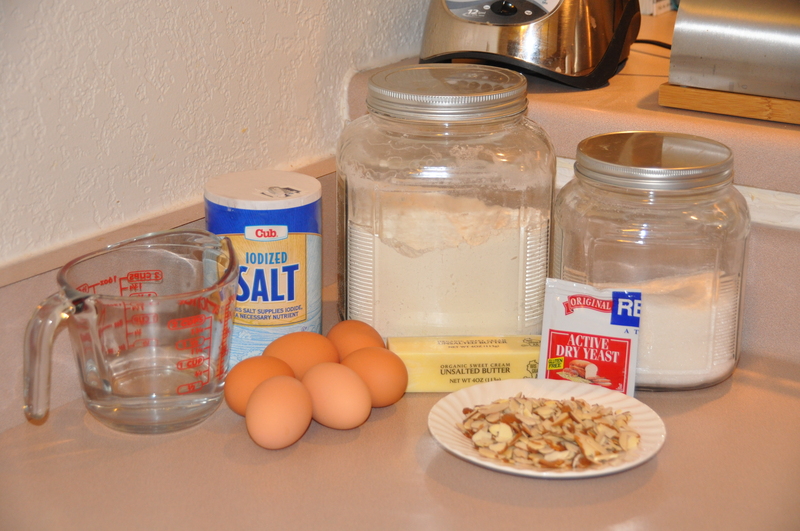 I found this recipe to be very similar to Italian Holiday Bread, but with a pleasant crunch from the toasted almonds.